Much of the world is burning or flooded. The temperate zones are still habitable - and one small island is teeming with climate refugees. Life in the Badlands is dangerous, disease-ridden, violent and controlled by gangsters and terrorists. But Valentina lives high in the privileged Citadel, at the heart of the heavily protected Green Zone. She is the president's daughter, sheltered, spoilt and arrogant. When she makes a secret trip to the Badlands, however, with her friends Pippa and Damian, she is forced to face up to the realities of life on the island and to the responsibilities her position brings with it. 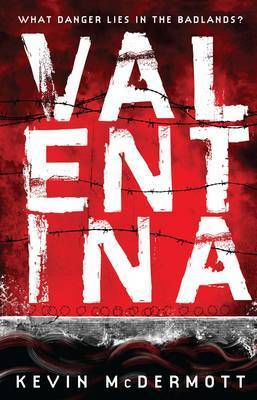 Valentina is a dystopian YA novel set on the island of Ireland, way in the future. It follows the absolutely mad escapades of Valentina , fourteen year old daughter of the president of the State of Free Citizens, as she leaves the safe haven of the Citadel, and travels to the badlands. If that isn’t enough to get you hooked I don’t know what is? To be honest, the main reason I picked this book is because it was written by an Irish writer, and it has been an age since I read anything Irish so I thought I’d give it a go. First things first, Valentina is both a terrible and wonderful narrator. She’s astoundingly annoying, like all fourteen year olds. But as aggravating as it might be, McDermott really captures the teenage voice, and I got more used to it as the book went on. As annoying as I found Valentina at the beginning, I had grown quite fond of her before the end. The plot is absolutely mental, completely ridiculous and I loved it. As realistic as Valentina was , the plot wasn’t. There is too much nonsense going on to take it seriously, but once I suspended my disbelief I really enjoyed it. However it was a little slow to start with, but as the narrative unfolded I became more and more interested. Give it a hundred pages before you give it up, it takes a while to kick in. Also, a big thank you to McDermott who didn’t throw in a clichéd YA romance, finally a dystopian YA novel without a love triangle. The world building in Valentina is fantastic. The island is divided into three zones, the green, amber and red zones, with the Citadel (where Dublin used to be) reigning over the rest of the island. The State of Free Citizens is a safe haven from the climate change and mass migration that is crippling the rest of the island. The politics relating to immigration in Valentina is really interesting, and quite topical the moment because of the issue with allowing refugees into the EU. I think I was a little old for this book, and I would have enjoyed it a lot more if I was 12 to 16 years old. Valentina is a quick but thoroughly interesting read. I would especially recommend it to anyone interested in dystopian fiction, but is a little tired of the formula most YA dystopian seems to be following.